Some people like to snuggle into a good book, I like to snuggle into a good embroidery kit. I do a lot of my own designs but my treat is to purchase a full kit. One that has a good photo of the finished piece and clear, concise charts and instructions. My go to designer is Tanja Berlin. Tanja Berlin’s kit came with the design printed on 100% Southern Belle cotton fabric, stranded DMC/Anchor cotton thread and a booklet with pages of charts and instructions. When you purchase a kit from Ms. Berlin she offers advice/comments on your WIP and finished piece. All you have to do is email her a photo along with a short statement of where you are having a problem. I have done several of her kits and while working 2 or 3 of them have emailed her with a ‘can you help me with a stitching problem’ request. She responded quite quickly to my emails. I greatly enjoy needle painting but if you view photos of Tanja’s website you will see that my shading skills are low compare to her’s. Still I will spend hours trying to improve my skill set and love doing it as I find it to be very relaxing. 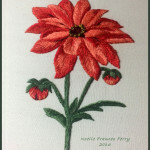 I say to beginners that the rules of each stitch are there to help you understand how to do it, but like me when my finished projects are not as prefect as the shown designer’s photo have fun, enjoy stitching and viewing your produced projects. When I start a new thread I leave the tail end parked in an area of the design that I will eventually stitch over. Once I have work a good area of the design I then go about pulling the tail ends of the threads through to the back side of the worked piece and weave those tail ends in among the stitched area. The needle, when not in use is stuck down (to park it) into an area of the design that I will eventually stitch over. If you look closely at the lower half of the main stem you can see needle holes from where I had parked the orange range of threads used for the buds. So Many years ago I didn’t think first before parking a thread or needle and messed up my first long/short project with needle holes showing outside of the worked area of my finished project. 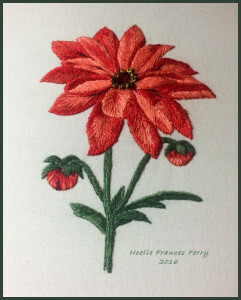 To me, that finished piece looked so poorly worked that I actually added butterflies about the stitched flower to hide my thoughtlessly placed needle holes! A favorite tool of mine is the blunted ended darner needle. 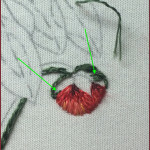 In this photo I am using split stitch to create the leaf’s edge (over which I will satin or long/short stitch). This bud leaf has curve edge (as I am following the design printed on the fabric). The neon green arrow points to where I have used the darner needle to push my stitch over slightly (to following the design’s curve) and I am bringing the sharp needle through to create a split stitch. This time I am using the darner needle to move aside previous bud stitches so that I can see the drawn on leaf design and bring up green thread for a leaf stitch. 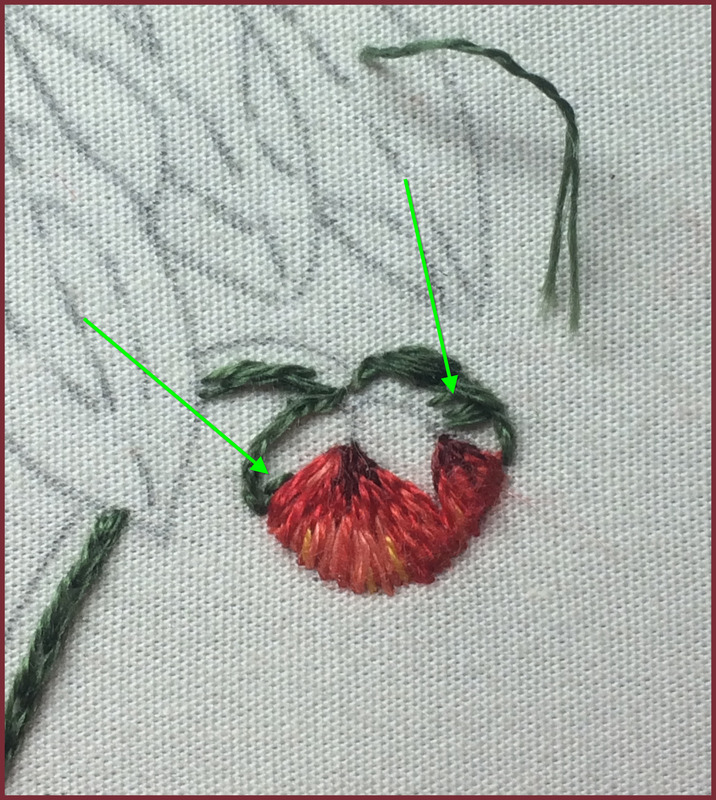 Left arrow points to the leaf stitch I did in previous photo. 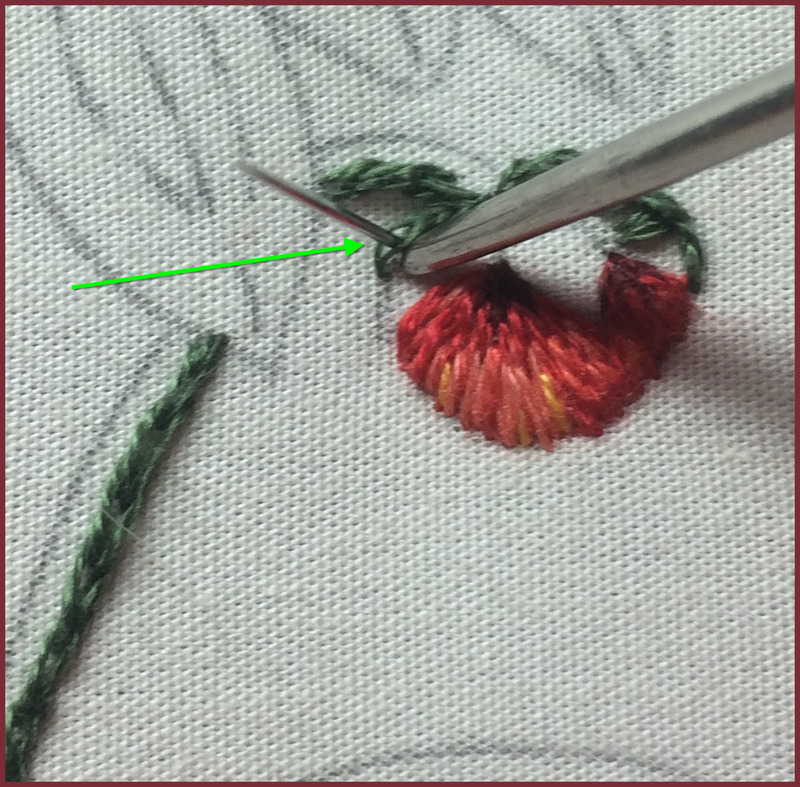 To get the curve of that leaf edge I will next come up underneath the middle of this stitch with my needle pointed out (towards the green arrow). I will be very careful that the point of my sharp needle does not snag the thread of this previous stitch. 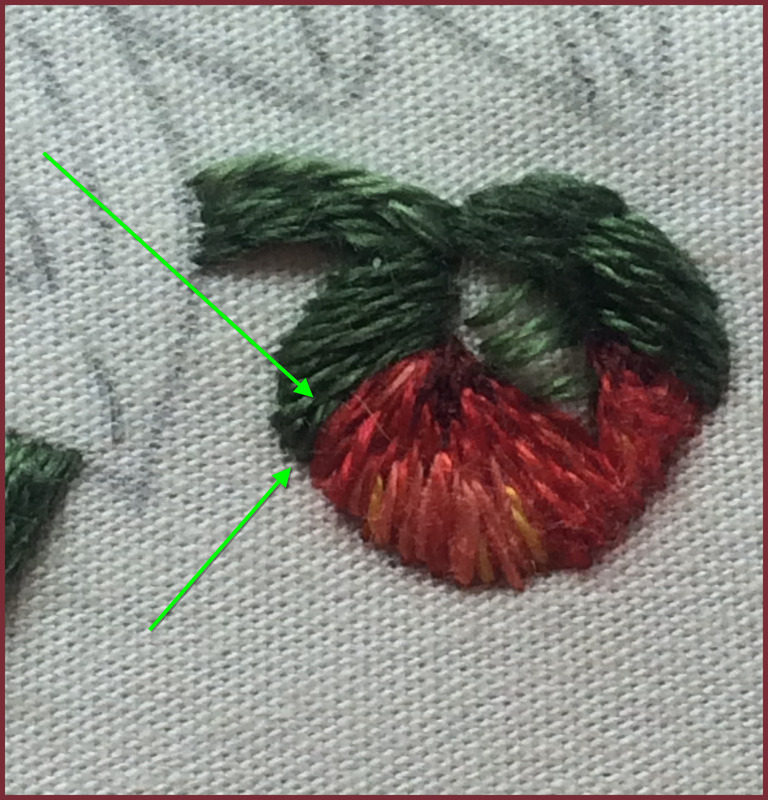 To create more 3-d look to a leaf (right arrow) I did 3-4 rows of horizontal stitches to create a tiny padded area over which I will satin stitch. 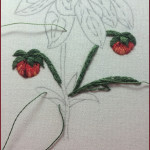 This area of satin stitches will have a lift up (and over the horizontal stitches) and then these satin stitches go back down to fabric level at the tip of the leaf. First is, notice the rows of spare stitches right in the middle bud leaf. That is for creating 3-d look, ie padded satin stitch. 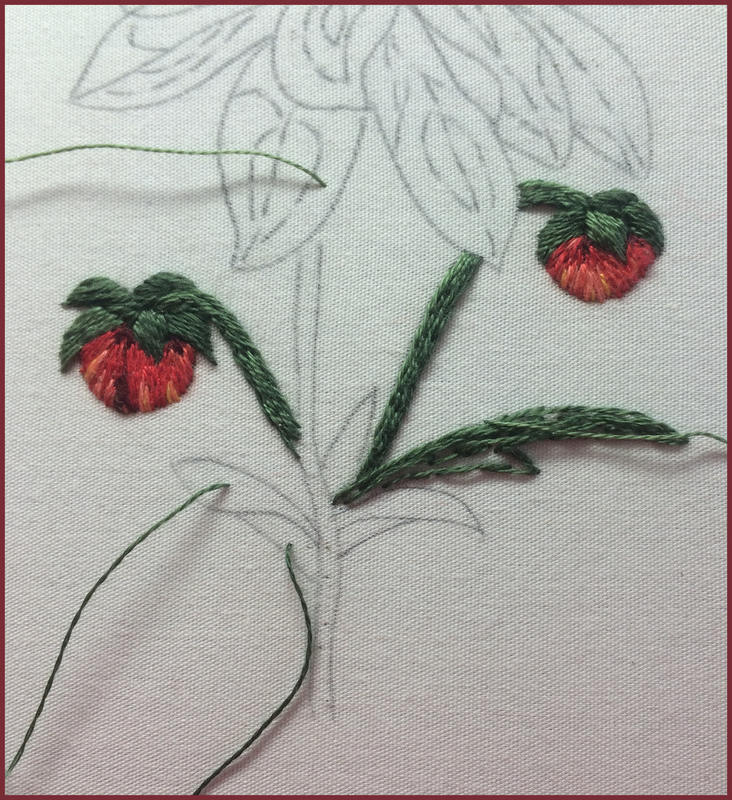 This is the top most leaf for the bud and I wanted those satin stitches to be lifted. 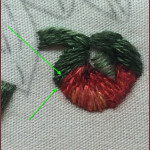 Second is, long/short and satin stitches are not suppose to cross over top of previous stitches. 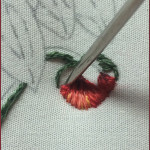 Within my previous comments I mentioned that I was bringing a stitch up underneath a previous stitch. What I did not say was that I laid the next stitch on top of that one to give it a slight lift and then down to be the tip point of that leaf. 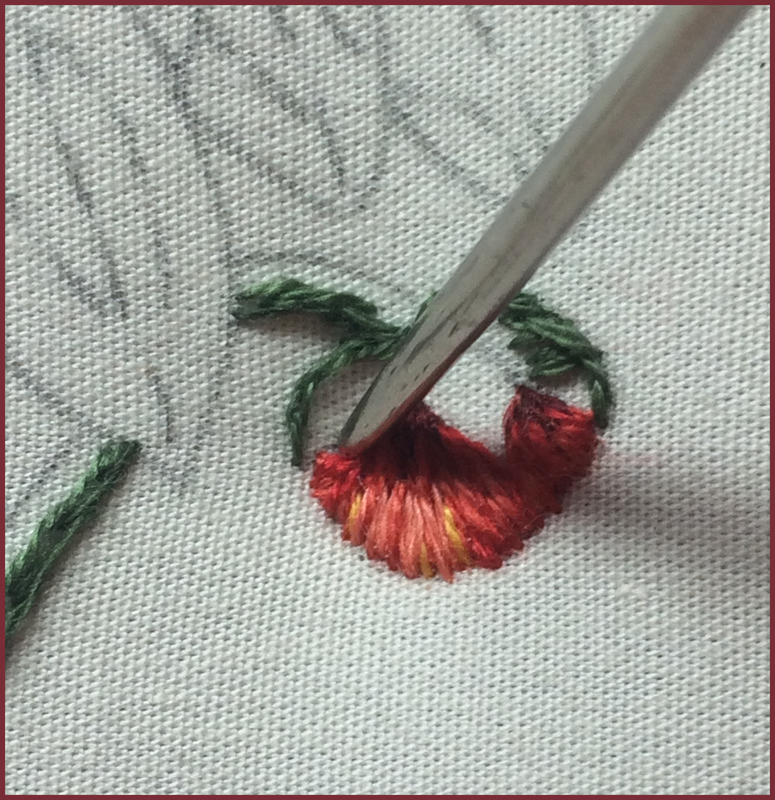 What I am trying to say is that there are established rules for particular stitches, like don’t cross over a previous satin or long/short stitch, but for me the needle is my paint brush and sometimes I bend a rule to get the look that I want.